Peru is one of the great centers of ancient civilization. The Norte Chico civilization already flourished along the Pacific coast as early as 3,000 BC. Many other civilizations such as the Moche, Chavin, Chimú and Nazca would follow, leaving behind fascinating ruins and artifacts. 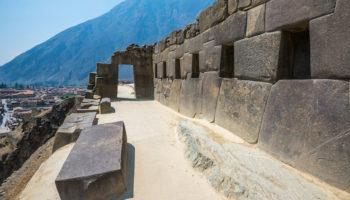 The most famous ancient ruins in Peru were built by the sun-worshiping Incas who emerged in the 15th century and would form the largest empire in pre-Columbian America. You do not need to be a history buff to enjoy Peru however. Other popular tourist attractions in Peru are some great natural wonders. The Andes run the full length of the country, rising to almost 7,000 meters (23,000 feet), and separate the arid coastal strip from the lush Amazon rainforest providing a diverse range of travel experiences. Spread out on the mountains above the bustling colonial village of Pisac are several impressive Inca ruins known as Inca Pisac. The ruins include a military citadel, religious temples, and individual dwellings, and overlooks the Sacred Valley. 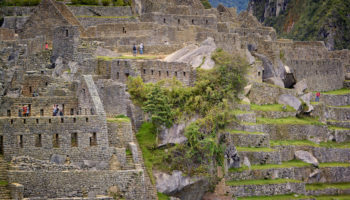 It is thought that Inca Písac defended the southern entrance to the valley and controlled a route which connected the Inca Empire with the border of the rain forest. Reached through the small town of Maras, Moray is an Inca site consisting of several enormous terraces carved into a huge earthen bowl. Each layer has its own micro-climate, according to how deep into the bowl it is. The temperature difference between the top and the bottom is as much as 15 °C (27 °F). For this reason, some theorize that the Incas used them as a kind of laboratory to determine the optimal conditions for growing crops of each species. The Plaza de Armas is where the city of Lima was born. Also known as the Plaza Mayor, it is the heart of the city, located in its historic district, with streets radiating out in a grid. The location was picked by the Spanish conquistador Francisco Pizarro in 1535. Today the plaza is flanked by a cathedral and several palaces. 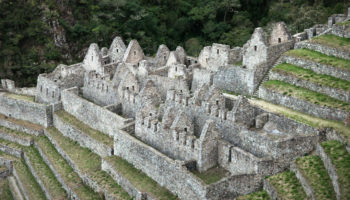 Kuelap combines ancient ruins with a cloud forest and the Amazon River. Kuelap is an ancient walled city built by the Chachapoyans, also known as the Cloud People, who lived where the Amazon carved a valley deeper than the Grand Canyon in the Andes. The fortress at Kuelap is the largest one in South America and pre-dates the Incas. Orchids and bromeliads grow inside the fortress. Cordillera Blanca is a mountain adventurer’s dream, offering hiking, climbing and mountain biking. Located in northern Peru, it has 16 peaks more than 6,000 meters (19,000 feet) high, earning it the nickname of “the highest tropical mountain range in the world.” Part of the Andes, Peru’s highest mountain, Huascaran, is located here. Cordillera Blanca also is a good place to see ruins of pre-Inca cultures. Sacsayhuaman is an ancient walled complex overlooking Cusco. The Incas built Cusco in the shape of a puma, which was one of their symbols, with Sacsayhuaman as its head. Sacsayhuaman is considered one of man’s greatest building feats. The fortress walls were built with huge boulders that dwarf humans; pieces were cut to fit so mortar wasn’t needed. The foundations can be seen today. The Lord of Sipan, who reigned around 100 AD, has been called the King Tut of the Americas because of the richness of his tomb. It is considered one of the richest archaeological discoveries in recent times. Sipan was king of the Moche who ruled along Peru’s northern coast centuries before the Incas. They were the best metallurgists of ancient times; their treasures can be seen in the Bruning Museum a few miles away. Salinas de Maras is located along the slopes of Qaqawiñay mountain in the Urumbamba Valley. This salt mine is a complex network of nearly 3,000 salt pans, shallow pools that are filled by highly salty water from an underground spring. The salt pans are believed to have been developed in pre-Inca times and today are still actively hand-harvested by local families during the dry season, May through November. This vast national park in the Amazon Basin is one of the best places in South America to see a stunning variety of tropical wildlife. With patience, wildlife is seen in most areas. 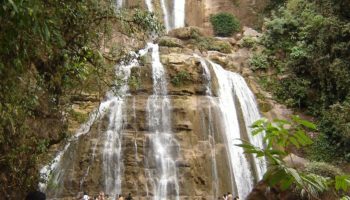 During a one-week trip, visitors can reasonably expect to see many different bird species, several kinds of monkey and a few other mammals. The best time to visit Manu National Park is during the dry season, between June and November. Remote, spectacular, and still not entirely cleared, Choquequirau is the sister city of Machu Picchu. Built in a completely different style than Machu Picchu, Choquequirao is much larger in area but not quite as spectacular. The hike to Choquequirao can be made with a trekking tour of three to four days and has become an increasingly popular alternative to the Inca Trail. Tours leave Cusco on demand and pretty much daily during tourist season. Pisac Market is a great place to experience the flavor of a picturesque Andean town market. The biggest market of the week is on Sunday, with smaller markets on Tuesday and Thursday. Travelers can see locals bargain over produce in the main market. A special “tourism” market offers locally made handicrafts. Good buys are local ceramics, including hand-painted beads. Pisac is about an hour’s bus ride from Cusco. 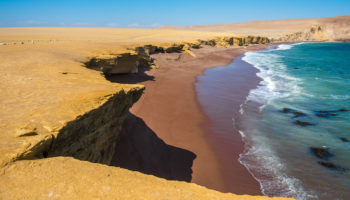 Paracas National Reserve, on Peru’s southern coast, is a desert reserve that occupies most of the Península de Paracas. Nature Conservancy says it’s a great example of Pacific subtropical coastal desert, with desert extending right to the beach. 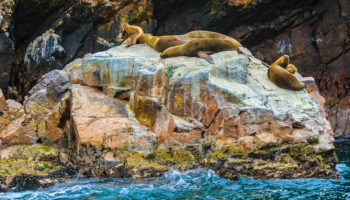 The area produces food for a wide variety of animals, including sea-lions, dolphins and 215 types of birds. The reserve also contains dozens of ruins of the Paracas people who lived there in ancient times. Ollantaytambo is an ancient Inca temple and fortress as well as a village located at the northwestern end of the Sacred Valley. This is where the Incas retreated after the Spanish took Cuzco. Below the ruins is the old town of Ollantaytambo. The town lies on top of Inca foundations and is one of the best examples of Inca town planning. Much of the town is laid out in the same way as it was in Inca times. Nowadays Ollantaytambo is a popular tourist destination and one of the most common starting points for the Inca Trail. 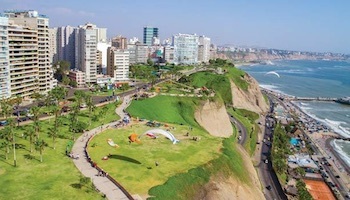 Miraflores is THE beach resort and entertainment center in Lima. Tourists and expats flock there to eat in fine restaurants, shop for local handcrafts and antiques, relax, party in a club, gamble at a casino, and just enjoy themselves. This Pacific Ocean beach also is popular with surfers and paragliders. The district is home to the Huaca Pucilana, an on-going archeological dig of pre-Inca culture. The vast adobe city of Chan Chan in Peru was once the largest city in pre-Columbian America. It is estimated that around 60,000 people lived in the city. The city was built by the Chimu around 850 AD and lasted until its conquest by the Inca Empire in 1470 AD. Although Chan Chan must have been a dazzling sight at the time, devastating floods and heavy rainfall have severely eroded the mud walls of the city. Today the most impressive aspect of the site is its sheer size. Located near Ica, Huacachina is a tiny oasis town surrounding a small natural lake and itself surrounded by towering sand dunes. Once a playground for the Peruvian elite, these days Huacachina mostly attracts international tourists. The big draw here is the opportunity to sand board and taking dune buggy rides on the sand dunes. Located on the northern coast, Máncora is a small town featuring Peru’s best sandy beach, stretching for several kilometers along the Pacific. 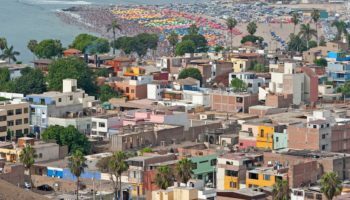 The town also boasts a large proportion of beach resorts, luxury restaurants and nightclubs for such a small town where the Pan-American Highway serves as the town’s main street. The consistently good waves makes Mancora a popular surfing destination while a raucous nightlife keeps visitors busy after the sun disappears. According to some, the Peruvian Amazon jungle is a better adventure holiday destination than its Brazilian counterpart around Manaus, with basically the same wildlife but less spoilt and better value. 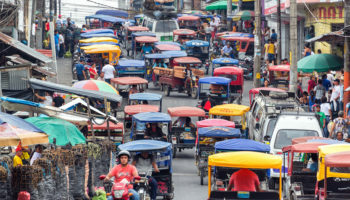 Starting point to an Amazon boat tour in Peru is Iquitos, the world’s largest city that cannot be reached by road. That leaves planes and boats as the primary means of entrance and exit for both people and supplies. The Nazca Lines are located between the towns of Nazca and Palpa along the northern Pacific coast. Created between 200 BC and 700 AD the figures range from simple lines to stylized spiders, monkeys, fish, llamas, lizards and human figures. The lines were created on such a large scale that it wasn’t until the 1920′s, when Peruvian airlines started to fly from Lima to Arequipa, that they were recognized as figures. Hotels and tour agents in Nazca offer round flights in a Cessna to view the lines. There is also an observation tower along the Pan-American highway with a view of three of the figures. Founded on October 2, 1580, the Santa Catalina Monastery in Arequipa covers a walled area of 20,000 square meters with walls, streets, walkways, stairways and small squares. The monastery is predominantly of the Mudéjar style, and is characterized by the vividly painted walls. It is one of the most important monasteries of colonial Peru and Latin America. Made of dried totora reeds, the artificial islands of the Uros are Lake Titicaca’s top tourist attraction. The lives of the Uros, a pre-Incan people, are interwoven with these reeds, which is a primary source of food and are also used to make their homes, their boats and even a reed flower tea. Reeds are added to the top of the islands constantly, about every three months, as they rot from the bottom, so the ground is always soft and springy. The Plaza de Armas has always been the heart of Cuzco, from the time of the Inca Empire when the square was called Huacaypata or Aucaypata, to modern day. The plaza is carefully landscaped with plenty of benches and walls for sitting, making it a popular outdoor lunch destination. Located in the city center, the plaza is lined with restaurants and shops as well as two Spanish churches; the Cathedral and the Church of La Compañía. Travelers who think the U.S. Grand Canyon is deep are likely to change their minds after visiting Colca Canyon in southern Peru. At 4,160 meters (13,650 feet), Colca Canyon is twice as deep as the Grand Canyon, though the canyon’s walls are less steep. The big attraction here, in addition to the awesome sights, are the Andean condors. The condors can be seen at fairly close range as they float on the rising thermals. The Inca Trail is one of the most famous hikes in the world, running 42 km (26 miles) through the Andes Mountains to connect the small town of Aguas Caliente and Machu Picchu. 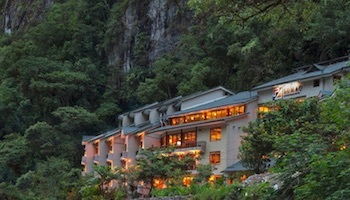 The trail also goes through cloud forests, jungles and Inca ruins. This is a high-altitude trek; hikers may experience altitude sickness. May to September are the best months to make the multi-day hike. Hikers should be prepared for cold nights on the trail. One of the most beautiful and impressive ancient sites in the world, Machu Picchu is the undisputable nr 1 among the top tourist attractions in Peru. 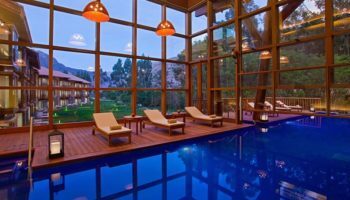 The “Lost City of the Incas” is invisible from the Urubamba Valley below and completely self-contained, surrounded by agricultural terraces and watered by natural springs. Although known locally, Machu Picchu was largely unknown to the outside world before being rediscovered in 1911 by historian Hiram. Which attractions in Peru do you consider to be the most interesting? No doubt in Peru quality places for traveler, Peru is so green full place. these thing is making great tour place to Peru than other places. Toppest tourist attractions place in Peru: Huacachina, Chan Chan, Mancora ,Iquitos (Amazon River), Uros Islands etc..
Great list… I would add the Cordillera Blanca with sixteen 6000m peaks its great place for climbing and trekking. The Nazca Lines are very cool. Great list you have shared with us here. Peru is one of the great and affordable centers of ancient civilization. You can add some unique destinations in your post such as Lima, Tambopata, Paracas, Nazca Lines, and Trujillo that are very famous in the whole world. Great information. Just want to point out that visiting Machu Picchu from July 2017, will be different. 2 new time schedules for entering, the first from 6 am to 12 pm & the second one from 12 pm to 5:30 pm. To keep in mind.